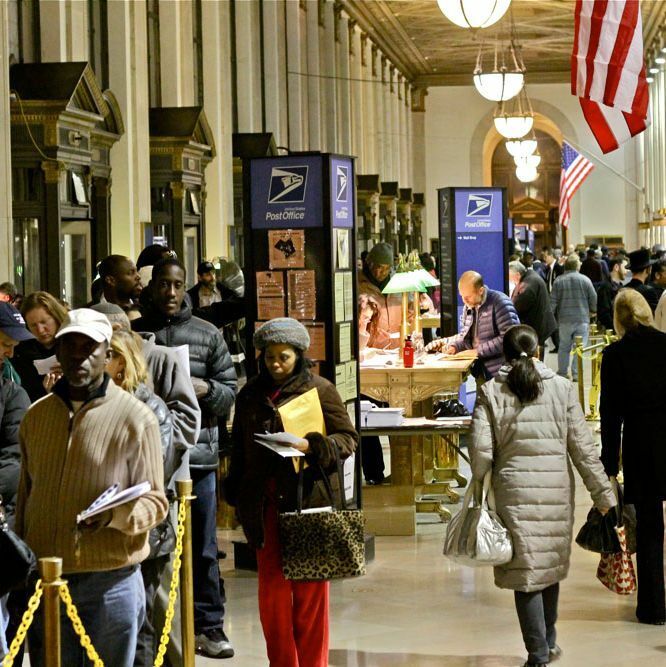 For one night a year, the James Farley post office — better known as the 24-hour post office across from Penn Station — hosts an unofficial procrastinators convention as scores of New Yorkers converge on the building to file their taxes before the April 16, 1 a.m. deadline. By 11 p.m. last night, about 60 of the city’s most tax-averse citizens stood on line outside, serenaded by a Columbia University marching band (which has turned tax night into sort of a thing). As the minutes ticked by, and speed-walkers became sprinters, Daily Intelligencer chatted up the city’s last-minute filers to find out how, exactly, it had come to this. “I had a twist in my taxes this year, and when I called the IRS to find out, I kept getting putting on hold for an hour at a time, and they couldn’t get me to connect with the right person. So I finally got the last bit of information today, and that let me do the last bit of my taxes. That was at about four this afternoon. And it’ll keep me out of jail.” —Anonymous, 11:12 p.m.
“I’m an idiot. I have a bad habit of procrastination. Like at night, I’d be going to karaoke instead of doing my taxes. [My favorite song is] ‘Michelle’ by the Beatles.” —Pat Love, 11:21 p.m.
CSI is so much more addictive. “I wasn’t thinking … Procrastinating … Watching TV, like CSI. I love CSI … I’ll be here earlier next year, like in February.” —Anonymous, 11:24 p.m.
Transplanting shrubs is more fun. “It’s kind of a tradition of mine — an unintentional tradition … But I was working, video editing. It’s long hours, months, weeks, years at a time. I just didn’t have the time. I do a 60-hour week. And on the weekends, I find something more interesting to do than my taxes. [Last weekend], I moved some shrubs.” —Kent, 11:28 p.m.
You don’t have to pay $2,000 to watch a movie. “It’s like when you receive a bad report, and you’re afraid to see it. I owe around $2,000. Watching a movie was more enjoyable than doing my taxes, obviously, because I don’t have to pay as much.” —Fausto Martinez, 11:39 p.m.
“This is actually an extension, so I am an epitome of a procrastinator … I actually just got back from the Bahamas last night, and I wake up Monday morning, remembering that I have to file my taxes … This is only going to add to the $17,000 I already owe the IRS.” —Andro Apacible, 11:45 p.m.
“Every year, because of my resistance to war, and no peace tax fund to re-direct war taxes to for peaceful uses, I’m stuck with a dilemma of conscience … I’m following my friends who run the National War Tax Resistance Coordinating Committee.” —Jonathan Stubbs, yoga instructor. “I was thinking back to the old days. I used to come here even when I wasn’t filing late. This place used to be totally crowded with people before the days of e-filing. And the funny part was accountants would try to come and pick up women, helping them with their taxes. It was hilarious. There were people all over the place with piles and piles of forms. There used to be music. It was almost like a festival … But this experience is getting kind of dull. I think I’ll come early next year.” —Elena, 12:23 a.m.
“I was supposed to submit it, e-filing, yesterday. At the last moment, it was rejected. It had pending status for 24 hours, and last minute, it was rejected.” —Anonymous, 11:52 p.m. Visiting inmates is more fun. “I am a really, really bad procrastination … Life happens, and taxes are really the penultimate goal, so you put it off as long as you can … Anything is more enjoyable than doing your taxes. Doing your taxes is on top of the worst things to do in your lifetime … This morning, I woke up and thought I had to do my taxes, and I said ‘no.’ I’ll do other stuff, like work. I was visiting inmates, and that was much more fun than doing my taxes.” —Richard Bernard, 11:53 p.m.
“Watching the Knicks. Just a little too much of that. When the Knicks lost, I felt I should have been doing my taxes.” —Dwight Dayle, 11:59 p.m. It was leg workout day. “I went to the gym. I have a routine. It was leg day today. [I did] three sets of twelve [squats. ]” —Todd, 12:04 a.m.
“I have 50 millions forms. I have four businesses in my life. None of them make any money.” —Abby Waxman, 12:05 a.m. Lack of a good mnemonic device. “I kept putting it off tomorrow, tomorrow, tomorrow. They were ready end of January … but anything is more exciting than doing your taxes. Anything! You don’t think about taxes until you hear the words April 15. Maybe if I’d heard the words a month ago, I would’ve done them earlier.” —Kristyna Kulpa, 12:11 a.m.
“I’ve been off from work for about a week and a half. I took a staycation so I could get [my taxes] in on time, and I’m here at midnight.” —Jose Duran, 12:19 a.m.
“These are taxes from three years ago. I was moving a lot. I have a business upstate, and I’m in the city during the week.” —Debbie D., Store Owner, 12:27 a.m.
“I’m just always a late filer. I’m used to coming at midnight. I know these guys here … It’s my annual routine.” —Danny Gonzalez, former postal worker. “I was not absorbing a co-enzyme form of vitamin B12 … As a result, one of the peptides responsible for generating more dopamine, noreadrenaline, and other catecholamines was not operating correctly, so I couldn’t rouse myself to get [my taxes] before now … Next year, it will be different … I can do things without lurching from event to event. I’m taking [a special co-enzyme] form of vitamin B12, and it’s better than crack.” —“An Old Geezer,” 12:30 a.m.